This kit contains the most frequently requested information. For any other questions, contact the Communications and Public Relations Service, by phone at 514-286-1414, ext. 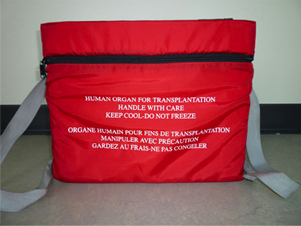 230, or by e-mail at info@transplantquebec.ca. The new visual identity was developed in response to the 2010–2014 Organization Strategy. The identity includes a new logo, name and motto. Combined, they reflect the organization’s renewed vitality based on the realities and issues inherent in the donation and transplantation system. The name Transplant Québec characterizes the organization’s ongoing mission. It refers to the organization’s raison d’être, as well as its development perspectives. The motto Ensemble pour le don d’organes, pour la vie (“Together for organ donation, for life”) attests to the critical need for all individuals and healthcare system stakeholders to consult and collaborate in order to realize the organization’s objective, organ donation. The logo’s symbol features three intertwined elements. The shapes, movement and colour bring to mind the green ribbon, the universal symbol of organ donation. The image’s overall composition represents solidarity, consultation, safety and harmony. The two crescents refer to the relationships inherent in Transplant Québec’s mission, as the organization collaborates with health system partners, donors’ families and the public, all in the name of saving lives. The crescents also represent the donation and the transplant, the donor and the recipient, very distinct entities engaged in a continuing process embodied by the circular, fluid motion. The space between the two crescents represents the distance that needs to be maintained between the donation and transplant teams. Together, all of the elements form the letter Q to reflect Transplant Québec’s uniqueness and Quebecers’ commitment to the cause of organ donation. For all requests regarding use of the logo, please contact Transplant Québec’s Communications and Public Relations Department. For all requests regarding visuals relating to Transplant Québec or the donation and transplantation process, please contact the organization’s Communications and Public Relations Department for help conducting your search. the photo will be used for non-commercial purposes only (textbooks are not considered to be business tools). Testimonials of children, adolescents and parents who are either transplant recipients or their family members. Emma has a new liver.